Given the fast paced nature of London, it is no surprise that pop-up street food stalls are quickly becoming one of the capitals favorite ways to eat lunch. Places such as Mexico and South East Asia are renowned for their street food cultures and it seems that London is starting to follow suit with its own take on pop-up eateries. The freshness, variety of cuisine and innovative nature of pop-up street food seems to be why people from all over the city are choosing to leave their packed lunch at home. Street food also has the advantage of being somewhat photogenic. This means that street food bloggers such as KS_Ate_Here written by Kar-Shing Tong and The London Street Foodie, written by Victoria Stewart can generate serious food envy with photos and rave reviews, inspiring other lunchers to seek out fresh new options. at @motherflipperuk for the ‘BREAKFAST MUFFIN’ of champions @brockleymarket yesterday. With the rise of street food markets, such as Kerb and Dinerama, indecisive foodies can now sample many different cuisines in one place. 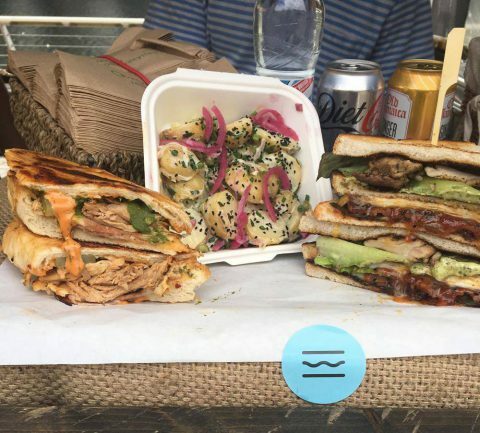 Londonmultimedianews.com caught up with Charlie from Project Sandwich, to get an insider’s view of the London pop-up street food scene and maybe try one of his mega sandwiches. If you fancy rejuvenating your lunch hour, then explore the map to find the pop-up street food nearest to you.